Although often overshadowed by more popular coastal cities, Fremont, California, has a lot to offer. When most hear of a movie being filmed in this state, they think of Los Angeles, San Diego or San Francisco, but believe it or not, there has been a few fantastic movies filmed right here! With stunning landscaping, tree-lined streets and picture-perfect weather, there is no doubt you can plan on seeing a lot more of this city on the big screen. 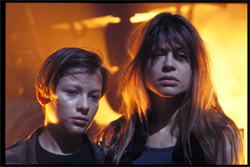 Terminator 2: Judgment Day is one of the most expensive movies ever made, costing $94 million. That being said, it brought in nearly $520 million at the box office. Nearly 1,000 crew members and 20 different sites were used to create this epic film, and although most was shot in Los Angeles and Santa Monica, the Cyberdyne Systems Corporation building in Fremont, California was used as well! The project team oversaw an abundance of stunts and chase sequences in the area as well. The entrance that you see to the building was hollow and went back about 20 feet. Then, you see a desk, and halls break off to laboratories. When the movie was filmed, there was nothing else in the area but a pile of dirt across the street. They blocked off the site for at least a mile radius on the night that they blew the building up, and the area was filled with fire trucks on standby. This 1979 sequel actually recruited a lot of their extras right from the California Maritime Academy located in Vallejo because the campus was so close to their filming location at the Fremont Raceway. All of the drag scene races for the film were shot here, a location now known as Baylands Raceway Park. While it did not make it to the big screen, there was a bit of filming done on Bicentennial Man in Fremont. There was a deleted junkyard scene originally done at Mission Clay Products located on Old Canyon Road. During this scene, Andrew Martin was attacked by a group of punks. Why Not Film in Fremont? Weather – As mentioned, the city sees nearly perfect temperatures for filming all year-round. An average temperature of 69 degrees Fahrenheit, plenty of sunshine, no snow and only 14.85 inches of precipitation annually is ideal for cast and crew. Quaint Downtown – The downtown area looks like it came out of a movie already. Buildings fall in a row, edged by wide sidewalks for plenty of foot traffic. You will find trees and large planters bursting with flowers in front of stores and along the street. Central Park – Lake Elizabeth is about one of the pretties places you will ever see. This 450-acre park boasts a manmade lake and all the outdoor activities you could ask for. When you add on the mountainous landscape, it is the perfect place for an array of films. Mission Peak – Just east to the city is where you will find Mission Peak. Although some believe it is an extinct volcano, others believe it was caused from erosion. Either way, the slopes and landscaping are stunning. Fremont, California, is by far one of the most perfect locations for filming. The area is breathtaking, and since it is not as populated as other major cities in the state, there is not as much traffic to deal with so road closures for filming won’t seem so monumental either. This article was contributed by Executive Homes Realty, specializing in luxury real estate in the Fremont, California area.